Finally, something happening in our neck of the woods of North County San Diego!! There is a LIVE Cuban band playing in Carlsbad. The original sounds of Afro Cuban music brought to you live in the North County. With selections from the repertoire of Cachito y Su Son and Salsa Mocambo. Let's definitely support this event. Vamos mi Gente! 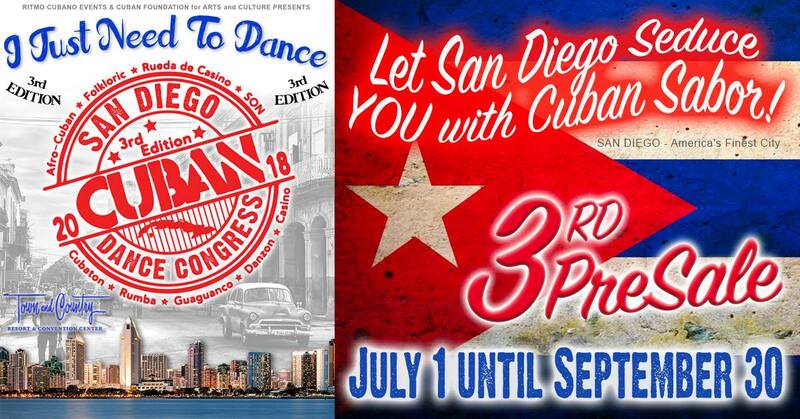 ATTENTION - ALL CASINEROS, RUMBEROS, SALSEROS AND AFRO-CUBANOS WORLD WIDE, SAN DIEGO'S 2ND CUBAN DANCE CONGRESS IS GOING TO BE AMAZING WITH LARGER WORKSHOP ROOMS, GREAT INSTRUCTORS, FUNCTIONAL WORKSHOPS AND THE FUN SAN DIEGO VIBE! YOU DO NOT WANT TO MISS THIS WORLD CLASS EVENT IN 2018! Special beginners intensive track - you will leave wanting more! Performances - if you want to perform, contact us. Given the really great interest in my beginner class series, the registration for the NEW Winter 2019 Beginner Level 1 Series is now created and live. HOW TO REGISTER: Click this link. Complete the online registration form. Please pay cash on the first day of class. LET’s KEEP THE SUMMER CUBAN MUSIC & DANCE FLOW HAPPENING SUNDAY, AUGUST 12, at CURUYE’s CUBAN SALSA TIMBA DANCE PARTY with DEEJAY WARAPO kicking off YEAR 9 of sharing his love and knowledge of Cuban dance music with L.A. & Southern California! CUBAN SALSA! SON! TIMBA! REGGAETÓN! IT’s AUGUST: The time of the year CURUYE commits to DONATING SCHOOL MATERIALS to students in the community. This year part of the proceeds from Curuye’s August Salsa Timba Cuban Dance Party will be donated to the students of the Covenant House SHELTER for HOMELESS YOUTH in Los Angeles. Imagine! by coming out to dance with your friends, you’ll be helping out a student or two! WELCOME BACK MARITZA BAÍDA to L.A. to teach a RUEDA de CASINO class at 5:30 PM! Pa’ La Orilla dancers CAMILLE RAY, and JEANNIQUE PROSPERE will be leading their fun and funky reggaetón line dances throughout the night! So far, KAREN POWELL, IVONNE ROMERO, RUBY ROJAS, AMY HARTENDORP, GRACE OSBORNE, JENNIFER FLANZER are celebrating their August birthdays with Curuye! Contact Curuye if you have an August birthday you’d like to celebrate! Share a meal with friends from The Granada’s kitchen! Chef Israel has entrees, sandwiches, and salads to fill up and energize hungry dancers! $10 cover includes the dance class! We are getting out the portable dance floor on the sand at Mission Beach and dancing until the sun goes down. Come dance with us. It will be a beautiful day for pictures and reunions of dancing families far and wide. To make this happen, we need all hands on deck to put the dance floor together and will need a minimum of 4 people and an SUV or truck to help transport the dance floor and help carry the dance floor patches to the sand and help me to snap it together. The dancing won't start until the dance floor is all connected and we will need help to put it back in the SUV/Truck after the event is over. Please contact Maritza at sbdiva32@yahoo.com to offer your help. The set up takes at least an hour to do because parking is an issue but totally worth it once we are out there. WHERE: Mission Beach on the sand nearest World Famous Restaurant: 711 Pacific Beach Dr., San Diego, CA 92109; we will be between Lifeguard tower 22 and 23. Parking - It can be very crowded with tourists and beach-goers. Suggest to carpool. Drive to the intersection of Pacific Beach Dr. and Mission Dr. There is a parking structure underneath the strip mall on Pacific Beach Dr. nearest the beach. Bring beach chairs, a snack to share. Water will be provided so if you want to bring something else to drink, you can. There are plenty of places to roam around nearby and get food as well. We'll be calling ruedas and leading salsa sueltas and one-on-one casino/salsa. A short rueda lesson will be offered as soon as the floor is snapped together and ready to go. An SUV or truck is needed to help me bring the dance floor to the beach. Can anyone let Maritza borrow their truck or SUV to load up the dance floor in Vista and help me to take it to Missions Beach? If no taker, we will dance on the sand. A minimum of Five Volunteers Needed at 3:30pm to help unload the snap-together dance floor and and all the equipment. If you are available to help, please contact Maritza at sbdiva32@yaho.com or call her the number listed on the Dance Instructor's Page of this blog. Una bulla! Hope to see you there! Registration is now open up for Beginner Level 2. Come sign up if you have completed Level 1 moves based on Maritza's curruculum. COST: $40 per person for the month of August. HOW TO REGISTER: Click this link to register. Enchufla Dile Que No y Dicelo!!! Come enjoy your Sunday afternoon at the Leucadia Art Walk in Encinitas while listening to live Cuban music. Cachito y su Son will be playing from 2:30 to 4:20 pm at The Lanai. 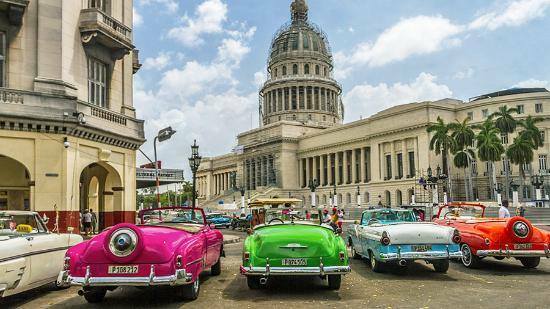 WHAT: Live Cuban music with Cachito y su Son! FREE!! 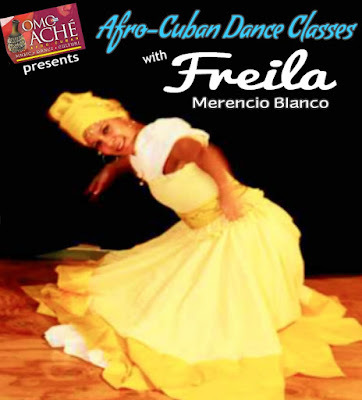 Afro-Cuban Dance with Freila M. Blanco - Thus. July 26th, Sat. July 28th & Sun. July 29th!! Female Orishas (Part I) Accompanied by Live Drumming! Female Orishas (Part II) Accompanied by Live Drumming! SUNDAY, JULY 29th: Two Hour Afro-Cuban Dance Workshop Co-Taught by former dance partners, Freila Merencio Blanco & Master Artist Juan Carlos Blanco teaching dances of Bantu traditions! *No previous experience is required; Just your desire to dance! *Skirts will be available for Orisha dance classes. It’s time for Sunday Rueda. Let’s start the week with some Timba, we have a new play list and are ready for the social dancing after class. See you tonight! 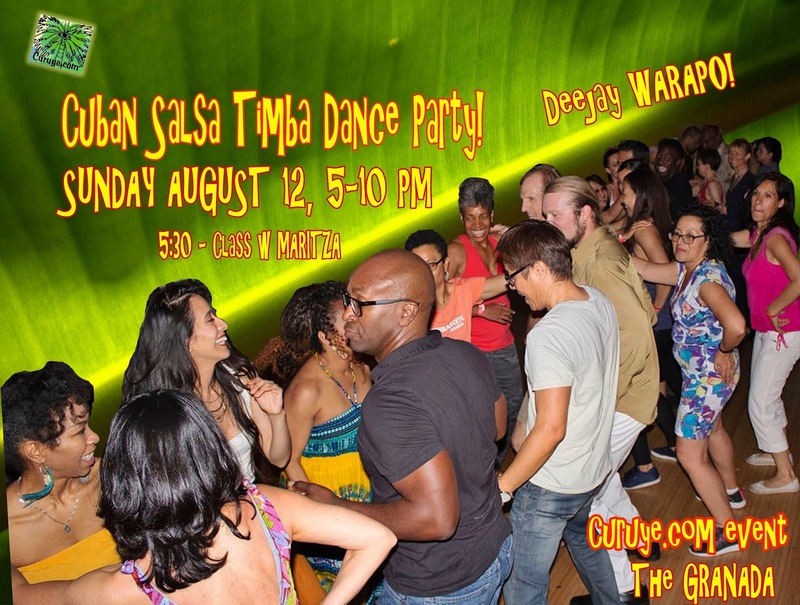 WHAT: Free Rumba Jam, with Timba in between sets. Lots of dance space! All ages. WHEN: Saturday, July 28th. 9pm - 1 am. Finally, something happening in our neck of the woods of North County San Diego!! There is a LIVE Cuban band playing in Carlsbad. The original sounds of Afro Cuban music brought to you live in the North County. With selections from the repertoire of Cachito y Su Son and Salsa Mocambo. Let's definitely support this event. 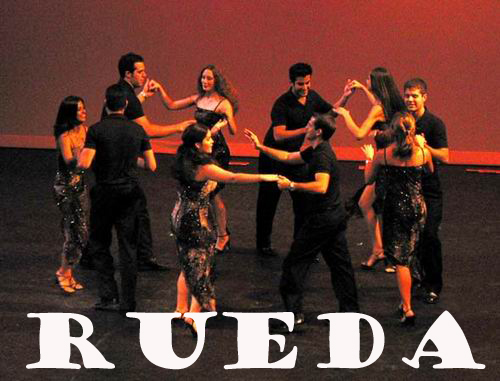 I am designating this as our Friday Rueda Practice event for the week. Vamos mi Gente! NEW Week-Day Afro-Cuban Dance Class! Starts July 12th! Looking for a fun week-day class to add to your work-out routine? Here it is! Afro-Cuban Dance Class offered weekly on Thursdays! This invigorating class is good for all people who want to move and strengthen their bodies. Accompanied by Live Drumming! All are welcome - Drop-ins, first-time curious, or those looking for consistent weekly dance work-outs. No previous experience is required. 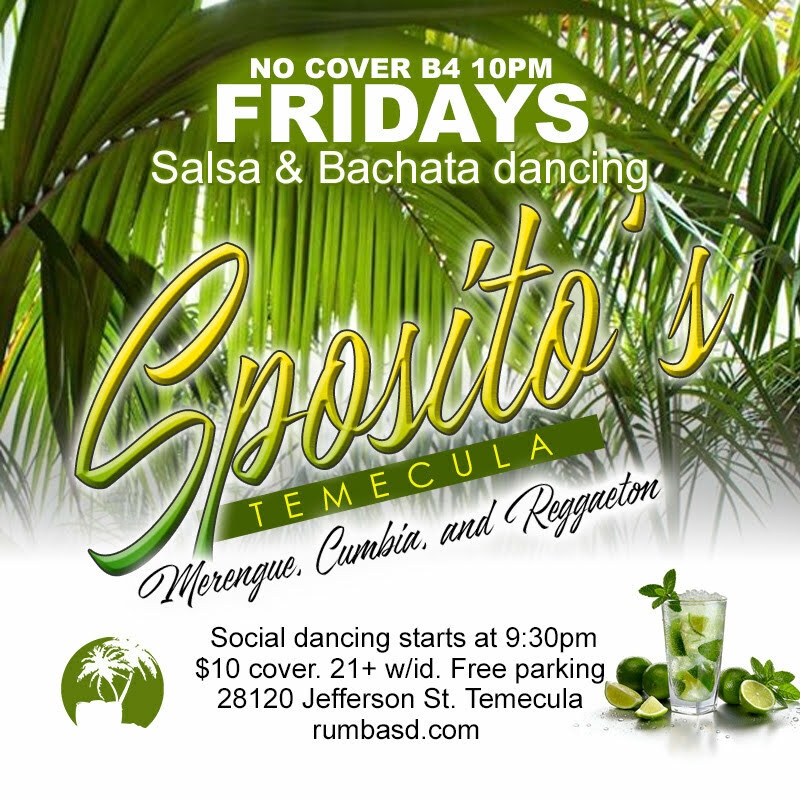 We are meeting up at Sposito's in Temecula this Friday for a Friday Rueda Practice. 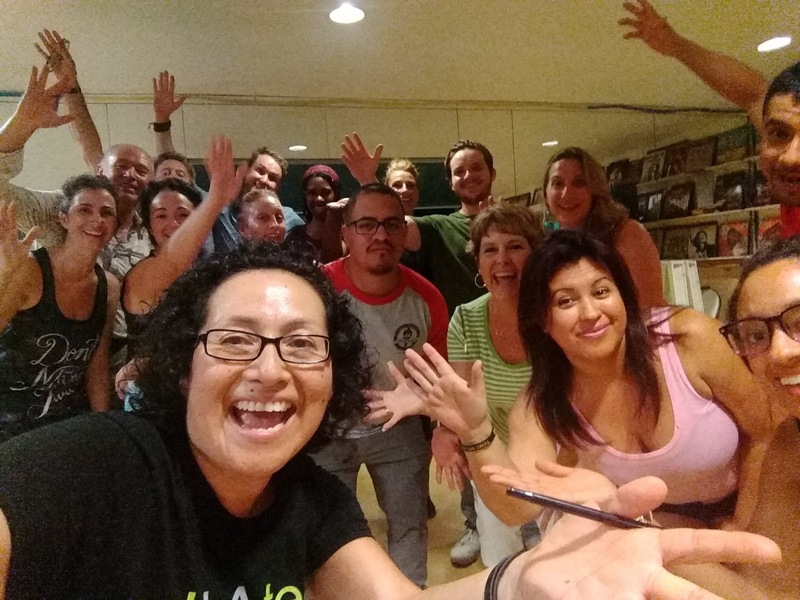 We had two beginner level 1 class series start for casino & rueda de casino. It's time to practice what we learned in the classroom into a social setting. All friends and casineros come dance with us. There will be timba in the playlist. Let's continue the 4th of July celebration into the rest of the weekend!! 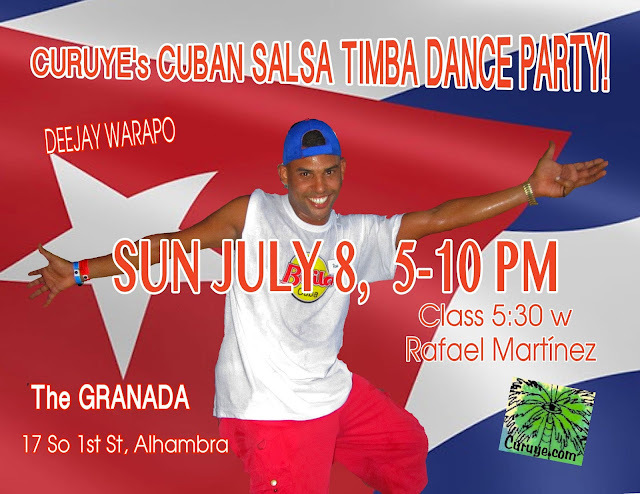 JULY is the month of CUBA’s most famous carnival, and this year we’ll be dancing it up big in L.A. to commemorate it with special guest RAFAEL MARTÍNEZ*, dancer from SANTIAGO de CUBA, partying it up with us at CURUYE’s JULY CUBAN SALSA TIMBA DANCE PARTY! DEEJAY WARAPO will keep the party happening with the LATEST and BEST CUBAN DANCE SOUNDS (including preview cuts from his label’s new cd!)! CUBAN SALSA! SON! TIMBA! REGGAETON! 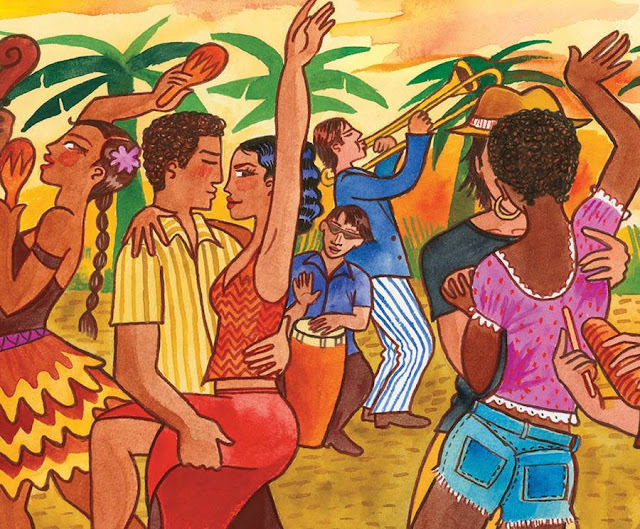 RUMBA!, Throughout the night, we’ll be dancing CASINO, RUEDAS de CASINO, REGGAETÓN, and RAFAEL and KATI HERNÁNDEZ will lead us in some carnival ‘conga lines’ Santiago carnival style! FESTIVITIES will include the birthday dance with FREDIA REEVES, JEHAN JACKSON, JENNIE ROSENBAUM, PATRICIA OVANDO! Arrive early! RAFAEL will be warming us up at 5:30 PM, so be sure to come early! The Granada’s Chef Israel serves up a variety of tasty dishes from entrees to salads and sandwiches for hungry dancers, so plan on eating at the GRANADA! Message Curuye if you’d like to reserve a table for your group. SPREAD THE WORD! LET’s WELCOME RAFAEL on his first visit to the West Coast! * RAFAEL IS ALSO GIVING 3 WORKSHOPS on SAT JULY 7 at The GRANADA including CASINO, RUEDA de CASINO basics; and RUEDA de CASINO int/adv. For more info, go to July 7 CUBAN DANCE WORKSHOPS...or CLICK HERE! With two new classes series and increasing one more plus vacation trip to Washington state, I am moving the start of Intermediate level 2 to August 7, 2018. So in July, please take classes with Wilfredo Guilbiac Rodriguez and Tim Snedeker. Check this link when they have classes. For now all my intermediate level 1 dancers, this is your opportunity to take a month long break and then start up and pre-plan your time. There is a time change for Intermediate Level 2 on Tuesday nights, instead, it will be offered from 8:30pm-to 10pm which is the only window available for me to teach an intermediate level class. Please park on the other side of the street where the studio is located. This is a residential location. You must already know the following moves: Dedo, Montana, Setenta, Setenta complicada, El Corto con la Bola, Saloneo, Kentucky, ronde footwork.